violinist, renowned teacher at the Birmingham Conservatoire and international conductor. Nic conducts a number of orchestras in the UK, France, Finland, Germany, Belgium, Greece and Romania as well as travelling the world playing and recording. 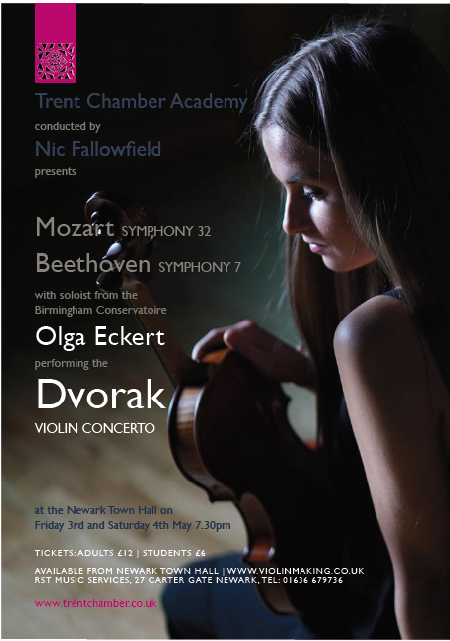 Nic is currently the co-leader of Sinfonia Viva (formerly The East of England Orchestra), and leader of the Tedesca String Quartet as well as being a guest leader in a wide variety of orchestras in Britain including the Scottish Chamber Orchestra and Manchester Camerata. The concerts will run in association with ‘Lutherie 2019’, a conference held annually in Newark drawing professional, amateur and student violin makers from all over the world. The Trent Chamber Academy was established in 2002 as the idea and inspiration of Catherine Janssens, a Belgian student then studying at the School of Violin Making and the result of a common wish to develop music at the School along with the expertise of musical director Roger Bryan who remains the resident conductor of the orchestra. Since then the orchestra has drawn its members from the Violin School as well as a number of woodwind players from the woodwind making course in Newark College. Their collective musical experience includes outstanding classically trained players from schools of music worldwide. The large international representation at the Violin School, provides the orchestra with members from Britain, Ireland, France, Germany, Spain, Belgium and many other countries. The concert will also showcase instruments made by the students over the last few years. Nowhere else in the world will you find an orchestra playing on instruments made entirely by its own players.